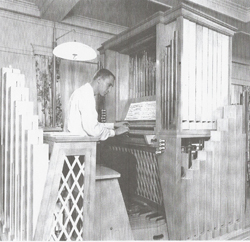 Rieger 23-rank mechanical pipe organ for sale. Two 61-note manuals and 32-note AGO concave, radiating pedals. 1,221 pipes, manual and pedal couplers, and tremulant; includes 3 separate mixture stops and 2 reed stops. Gently voiced for a chapel or home use. Compact design: width: 5′-81⁄8″, depth 7′-3¼″, height 7′-3½″ with separate electric blower 2′ x 2′-1″ x 2′-5″. Mechanical key and stop action, slider windchest. For more details call 360/945-0425 or see OHS Organ Data Base, Rieger Orgelbau, Gaspar Schulek Residence.